BEIJING — China's navy says its forces rescued a freighter from attack by pirates in the Gulf of Aden over the weekend. Missing from the report was any mention of the participation of the Indian navy, which says it dispatched four ships and a helicopter to provide cover for the action. The omission was likely no accident. Deep distrust persists between the two nuclear-armed Asian giants, and in recent days, China has angrily denounced New Delhi over a visit by exiled Tibetan spiritual leader the Dalai Lama to an Indian border area that China claims as its own territory. Asked about that lack of mention of India's part in the operation, Chinese foreign ministry spokeswoman Hua Chunying referred questions to the defense ministry, where no spokesman was immediately available for comment. "We believe the aforementioned operation demonstrated the effectiveness of China's naval forces in the field of fighting against pirates, as well as China's image as a responsible major country in safeguarding regional peace and stability," Hua told reporters at a daily news briefing on Monday. "We are always positive toward international counter-piracy operations," she added. No casualties or damage were reported in the incident, which unfolded between Saturday night and early Sunday morning. The Chinese navy's statement said a distress signal was received late Saturday from the captain of the Tuvalu-flagged OS35 saying it was under attack by an unknown number of pirates aboard a single boat. Steaming to the area, the missile frigate Yulin then circled the ship while its helicopter hovered above. The statement said 16 members of the Chinese special forces were lowered onto the ship by helicopter at dawn Sunday and released the 19 crew members from the strong room where they had taken shelter, while also searching the ship to ensure there were no further threats. The statement made no mention of any arrests or other contact with the pirates. India's account differed slightly but did mention China's participation. A statement from the Indian defense ministry said the Indian navy ships Mumbai, Tarkash, Trishul and Aditya had been sailing toward the Mediterranean Sea when they responded to the distress call and "rapidly closed the merchant vessel" by early Sunday." After an Indian navy helicopter flew over on Sunday morning, crew members emerged and "ascertained that the pirates had fled the ship at night." "Subsequently, in a show of international maritime cooperation against piracy, a boarding from the nearby Chinese navy ship went on board the merchant ship, while the Indian naval helicopter provided air cover for the operation," the statement said. India and China fought a brief but bloody border war in 1962 and each makes large claims on territory controlled by the other. That includes India's remote northeastern state of Arunachal Pradesh, to which the Dalai Lama traveled last week amid angry denunciations from Beijing. Hua, the foreign ministry spokeswoman, said last week that the visit "severely harms China's interests and the China-India relationship," and that China did not consider it an Indian internal affair. The Dalai Lama and his followers have been living in exile in northern India since they fled Tibet after a failed 1959 uprising against Chinese rule. China accuses Tibetan Buddhism's highest figure of using his religious status as cover for a campaign to win independence for Tibet, which was occupied by Chinese Communist forces in the early 1950s. In general, China has been eager to highlight growing cooperation between its military and those of other nations in training and other operations, and the Yulin is part of the 25th anti-piracy squadron sent by China since it joined multinational patrols off the coast of Somalia in 2008. That involvement offers both a sign of China's growing engagement in the global commons and valuable practice for its navy in operating far from home ports. 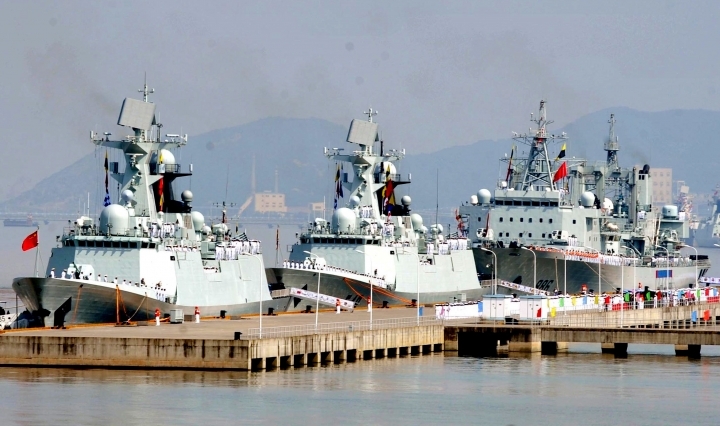 The mission has also resulted in China building its first military base in a foreign country in the African Horn nation of Djibouti, mainly as a supply and recreation facility for its anti-piracy patrols and peacekeeping operations in South Sudan and elsewhere in Africa. The navy says it has escorted a total of 6,337 Chinese and foreign vessels during its anti-piracy operations and intervened dozens of times in cases where ships were either attacked or pursued by pirates.